The Children’s Cabinet, Inc. was established in December 1985, as a private non-profit organization with the mission of creating a lasting public-private partnership to address the needs of children and families in our community. This unique commitment to public-private partnerships provides a foundation for the Cabinet’s organizational strength by being able to respond quickly to the changing needs of the community and to bring about true collaboration in the delivery of service. Today, the Cabinet serves more than 15,000 children and families each year. 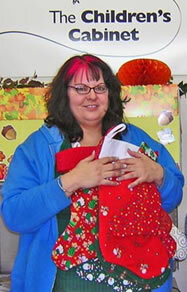 Northern Nevada Chapter sews and contributes Christmas Stocking to this organization. It is a popular project; everyone seems to enjoy making Christmas Stockings.